It's been a while since we posted a Quick Pick & Project of the Week. We were inspired this week to get back to sharing a few ideas. 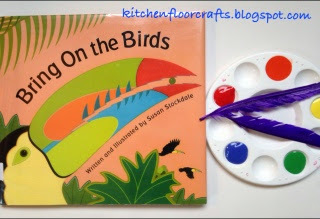 A couple of weeks ago we picked up this book, Bring On the Birds, from our local library. The book uses crisp illustrations and simple and engaging text to describe a variety of birds. We especially love all the verbs the book uses to describe the different birds and their actions. 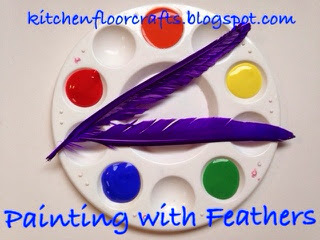 We like our Quick Pick & Projects to be simple, so we were inspired to try painting with feathers. 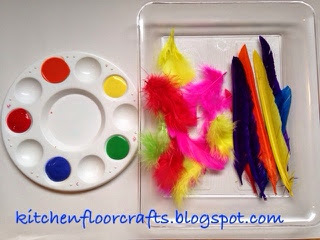 I put out two kinds of feathers, small craft feathers and a larger, longer craft feather. 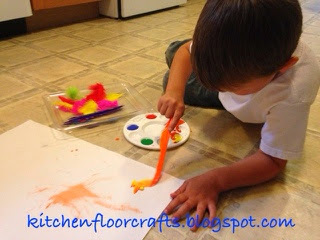 We also used our washable poster paint. Big Brother instantly started painting with the longer feathers. 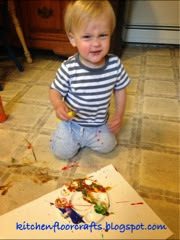 He started by practicing mixing colors. Later he made a card for his grandmother. Little Brother also became quickly interested and needed his own painting set up. 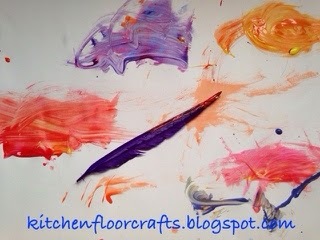 His painting process reminded me why we try do these projects on the kitchen floor . . . This picture is a little blurry but I couldn't resist his fun expression. His finished work is below. It's really fun to see him getting so interested in our crafting projects. 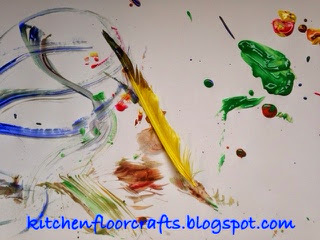 I tried painting a little too, the longer feathers very smoothly spread paint across the paper. We'll definitely be trying this again for other projects.